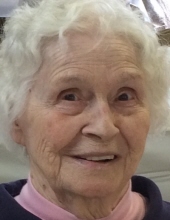 Loretta Parr, 98, of Mansfield passed away January 30, 2019 at her home. Loretta was born February 12, 1920 in Turtlecreek, Pennsylvania to Joseph and Mary Egloff Berger. She was a 1938 graduate of St. Peter's High School. Loretta was a proofer for the News Journal retiring in 1978. She was a member of St. Peter's Catholic Church and enjoyed crocheting, playing cards and bingo. She was the matriarch of her family who were her everything. Survivors include her children Clendon "Jay" N. Jr. (Sherryl) Parr of Bellville, William (Suzanne) Parr of Shelby, Bonnitta Debo of Mansfield, Carol Parr of Mansfield; 20 grandchildren; 31 great-grandchildren; 1 great-great-grandchild; sister Mary Kramer of Sylvania. In addition to her parents she was preceded in death by her husband Clendon Sr. "Bill"; sons Ronald, Edmund, Paul; brothers Joseph, Eugene, August, Albert, Lawrence, Ralph, Elmer; sister Helen Stanton. Friends may call at Herlihy-Chambers Funeral Home, 173 Park Avenue West, Monday from 5-8pm. A Mass of Christian Burial will be celebrated 11:30am Tuesday at St. Peter's Catholic Church with Fr. Austin Ammanniti officiating. Burial will follow in Mansfield Memorial Park. In lieu of flowers, memorial contributions may be made to the Msgr. Dunn Foundation or St. Peter's Church. To send flowers or a remembrance gift to the family of Loretta Parr, please visit our Tribute Store. "Email Address" would like to share the life celebration of Loretta Parr. Click on the "link" to go to share a favorite memory or leave a condolence message for the family.